MANILA, Philippines — Tens of thousands of villagers fled the likely path of a powerful typhoon bearing down Friday on the Philippines, as the government braced for the possibility of a second disaster just days after a storm killed more than 400. Heavy rain drenched mountainous coastal regions in the northeast as Typhoon Parma tracked ominously toward heavily populated areas still saturated from the worst flooding in 40 years. Parma was forecast to hit the east coast Saturday, packing sustained winds of up to 120 mph (195 kph) and gusts up to 140 mph (230 kph). Officials fear it may develop into a “super-typhoon,” the government’s weather bureau said. President Gloria Macapagal Arroyo declared a nationwide “state of calamity” and ordered six provincial governments to evacuate residents from flood- and landslide-prone areas in the path of the storm. 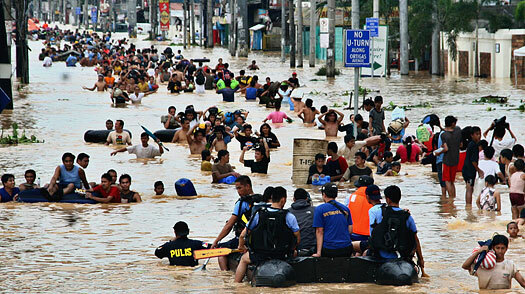 The “state of calamity” extends the one applied to Manila and 25 provinces hit by the earlier storm. The declaration frees up funds to respond to emergencies. The earlier storm, Ketsana, wrought a trail of destruction across four Southeast Asian countries, killing at least 422, including 293 in the Philippines, 99 in Vietnam and 14 in Cambodia. The Red Cross in Laos said Friday at least 16 people died and 100 were missing in two provinces that were still largely cut off. In the Philippines, National Disaster Coordinating Council chief Gilbert Teodoro said children and minors can be evacuated from Parma’s path by force, but adults will be given information to make their own decision. In Albay province alone, almost 50,000 people were evacuated Thursday and Friday with the help of the police and military trucks, said Cedric Daep, a top provincial disaster official. 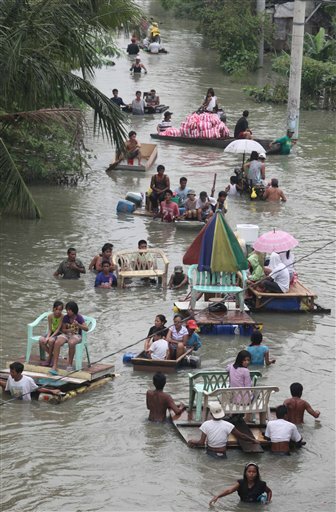 The Philippines is hit by as many as 20 major storms a year and is well practiced at battening down. Typhoons in the region are most common and usually most powerful from August to November. Laundry worker Mely Malate fled with her husband and six children to an evacuation center in Albay, spurred by memories of a storm three years ago. Government chief weather forecaster Nathaniel Cruz said Parma appears to be carrying less rain but stronger winds than Ketsana, meaning the flood risk may be lower. But a vast swath of the northern Philippines, including the capital of Manila, is already saturated from Ketsana, and any more rain poses danger. Lake Laguna on the edge of the capital rose by more than 3.3 feet (one meter) as Ketsana passed and was in danger of spilling over into districts near Manila housing some 100,000 people, said Ed Manda, general manager of the Laguna Lake Development Authority. The typhoon comes as the Asia region struggles to recover from two major earthquakes, one in the South Pacific that caused a deadly tsunami, and another in Indonesia. Associated Press writers Oliver Teves in Manila, Minh Van Tran in Hanoi, Vietnam, and Ambika Ahuja in Bangkok contributed to this report.